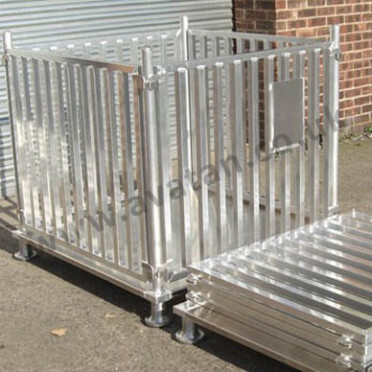 Made to order standard and special sizes of aluminium and stainless steel cage pallets and stillages. Fabricated from light weight aluminium extruded box section or for heavy duty requirements fabrication from stainless steel. These stackable and collapsible stillages comprise a base, four removable posts, and four removable gates. They can also be manufactured as a rigid non-collapsible unit. Stillages manufactured from food grade aluminium with all tube ends sealed offering an hygienic and easily cleanable stackable pallet. Each unit comprising sheeted flat base, four drop in tubular removable posts and four easy fit removable gate frames. Mounted on cast aluminium round pallet feet. Suitable for most food and pharmaceutical applications.